Just as many blog owners enjoy the option to include photos and videos to their blogs, some would like to add office type multimedia. Queries about adding PDF documents, spreadsheets, and Word documents, to our blogs, are frequently seen, in Blogger Help Forum: Learn More About Blogger. One of the issues that need to be considered is that many professional documents are created using proprietary office software. PDF files, for instance, are created using Adobe Acrobat. Excel spreadsheets and Word documents are created using Microsoft Office. Another issue may involve confidentiality. Office documents may contain confidential data, that's not intended for the world to view. Google has a solution for handling all of these proprietary file formats, and for the confidentiality issue. Google provides Google Docs / Drive, which can be used to develop, publish, and share proprietary professional multimedia files - and maintain confidentiality. Start by uploading any "professional" format file. If you have a professional file, accessible from your computer, just open Google Docs / Drive, and upload the file. The "File upload" wizard has the standard wizard to "Select a file from your computer". Or, you can make a new file, using Drive. Alternately, you can develop a new document, using "NEW", and selecting the appropriate document type. You can embed a Docs / Drive file in an IFrame, using the document link. Having created or uploaded your file, follow instructions to embed or share your document, using Google+, EMail, FaceBook, and Twitter. Using an IFrame, you can embed a document in any HTML gadget, page or post - or even publish to a separate page, in the blog. First, open the document / file. With a Docs / Drive document displayed, click "File - Share". This gives you the "Share with others" wizard. Take the link, and build the Embed - or add the link into a blog gadget or post. Here is a live Google Drive document. The link leads to the document, as embedded below. Google Calendar is a useful complement to all of these. You can embed your calendar - or anybody else's - using instructions from Google. There are various options, for adding a blog to a Google Doc or a website. 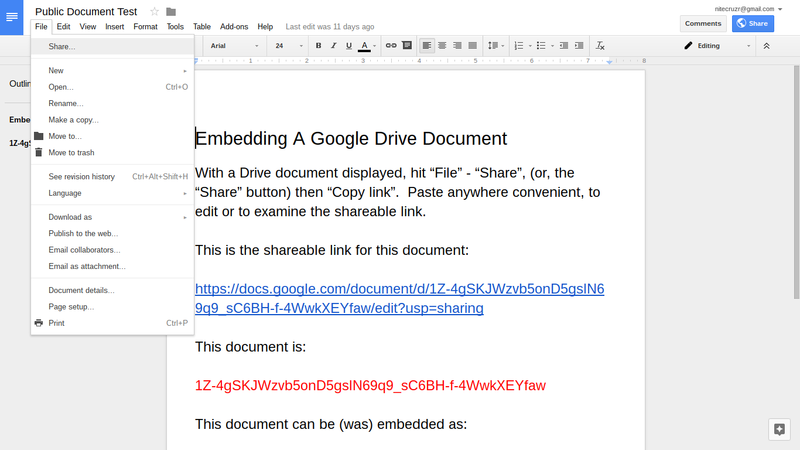 Adding a Google Doc / Google Drive file to a Blogger blog will have similar possibilities, similar to adding a Blogger blog to a website. 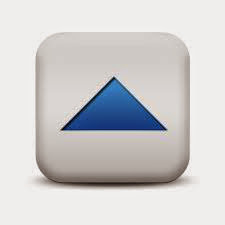 Use Drive for developing collaborated documents. Be sure to set appropriate editing and viewing permissions for your readers, in the "Share with others" wizard. 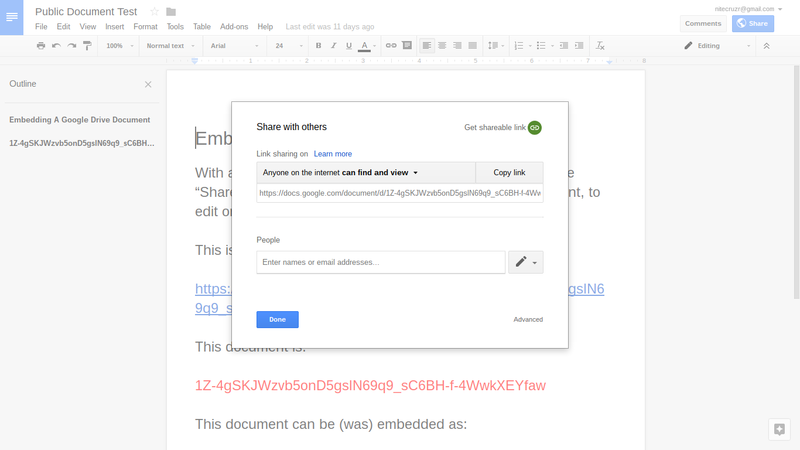 "Share with others" lets you create collaborative documents - giving other workers the ability to comment on and / or edit your documents, as you designate. 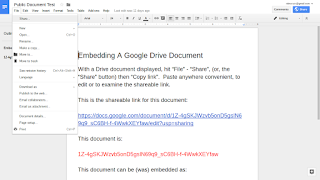 You can use Google Drive to develop important documents, in a group environment - and avoid the stress caused by AutoSave and Draft blog post editing. Maybe Blogger is not a Content Management System - but Google Drive can be. can't wait to try this!! Chuck, I want to create a document that I can edit/save. I've had that horrible experience of losing the post while composing; hardly edit on line now. 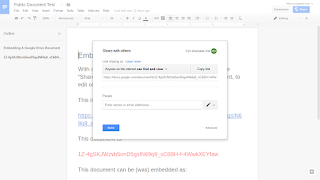 If I understand your last post about Google Docs, we edit documents over a period of time before embedding into post. My question is about the sharing wizard. I do not want my working document looked at until it's published on my blog. thanks. Create a blank document - then hit Share and see who it is shared with, by default. I think that you will see that it is shared with no one. Until you share a document, it is not capable of being looked at, by anybody. Is it possible to made a spreadsheet with sortable tables, that anybody viewing on the blog can resort by clicking the respective tables? You can sort a Google Sheet, on a column by column basis. You don't just click on the column - you click in the pull down menu for the column, then select a sort ("a-z" or "z-a"), from the context menu. If you want to post in Blogger Help Forum: Get Help with an Issue, we could explore this in depth. There's a lot more to Google Sheets than I can show you, here.